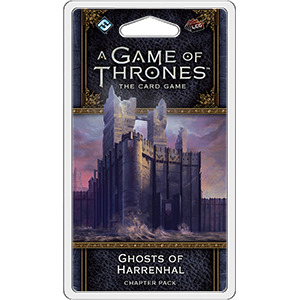 Now, you can enter your own name in contention for this sprawling castle with Ghosts of Harrenhal. As the War of the Five Kings has touched every corner of Westeros, you’ll find plenty of new cards in this expansion that interact with the King trait, while other cards help you counter the drastic bloodshed of Valar Morghulis (There Is My Claim, 80). Finally, you’ll encounter plenty of iconic characters in this Chapter Pack, including Roose Bolton, Brienne of Tarth, Craster, Ser Davos Seaworth, Joffrey Baratheon, and Myrcella Baratheon.